At Apple's primary assembly partner, Foxconn, the copper-tinged version of the "iPhone 8" is known internally as "blush gold," according to rumors circulated over the weekend. The color's name recently appeared via a leak on China's Weibo, where it was noticed by Tech Grapple. A parallel claim was made on Twitter by well-known leak source Benjamin Geskin. It's uncertain whether the term will be used for a shipping product. Both did suggest, however, that the phone will be available in 64- and 128-gigabyte versions. That may be unlikely, at least without an additional 256-gigabyte model, since Apple sells the iPhone 7 in 32-, 128-, and 256-gigabyte variants. Even the iPhone 6s is now sold with 32 or 128 gigabytes. In the past couple of weeks, multiple reports have pointed to the existence of a "copper" or "copper gold" edition of the "iPhone 8." The shade has appeared on multiple design dummies, and if real is expected to join black and silver options. Even if they're authentic, the dummies may not represent the final form of "copper/blush gold" units. They have so far had unusual yellow edges, and white front bezels, both of which would likely be changed to present a more seamless appearance given an edge-to-edge OLED display. A render supplied by Geskin (seen above) may be closer to its final appearance. The "iPhone 8" may ship as soon as next month, but could be available in extremely limited quantities. Some other rumored features include wireless charging, faster cable charging, and a facial recognition system that may even replace Touch ID. The absence of a 256GB option is strange. I wonder if this 64/128 Foxconn barcode data point pertains to the standard tier iPhones (so called 7 s in the media). Perhaps the 256GB option will be limited to the higher tier phone (so called iPhone 8 or iPhone Pro). They could not come up with an uglier color....Black and Polished are the only options...IMO.. The white-silver looks sweet but no 256 GB option is strange...i had my heart on a mega-capacity device. 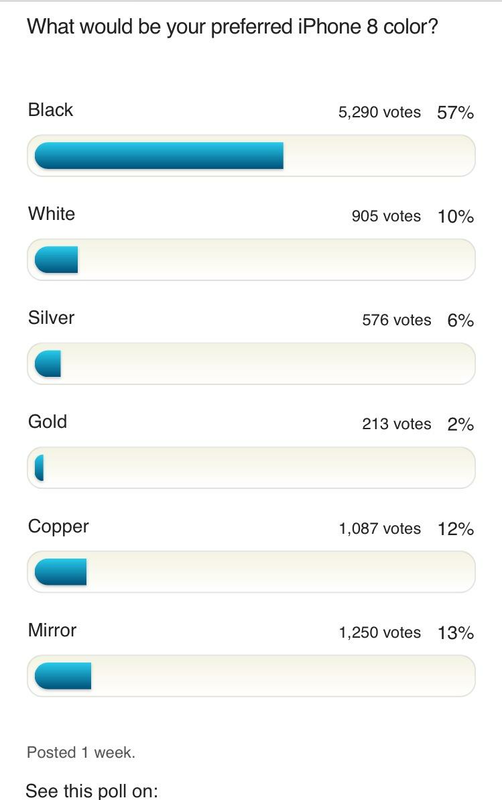 this color looks much better than the "copper" color reported last week...there was a poll on another site with almost 10,000 votes and "copper" was in 3rd place behind "black" and just being edged out by "mirror-finish"...so obviously they did their market research, supposedly aimed at the fashion conscious and women. This color is a much better alternative to "rose gold"
I like 64GB option. Apple might offer 64/128/256 for iphone 8 and 32/128/256 for iPhone 7s. Same sources that called: "Piano Black" last year? But seriously, it doesn't add up to me. The price points for the iPhone 8 are not going to justify a 64 GB model. It will come exclusively in 128 GB & 256 GB. Sidenote: I can't wait until the announcement next month so we'll NEVER have to see another image that shows screen content above the notch. If true, that bronze color is pretty hideous looking. Hopefully Apple will make Jet Black available for the OLED iPhone. Think flesh tone. Make-up is also called "blush." This suggests the iPhone will have less contrast against the user's hand or face. This color provides a "smaller" apparent profile, for any given physical size. ANY new iPhone color advertises status for its owner, but flesh-color is camouflage (north of the equator). Brown... maybe they were trying for bronze. Rose Gold looks pink. It probably wasn't as popular are they expected. I'm using gold + black case. They should, call it "flush gold." Sure they could. They could have made it Zune brown. I reckon the 7s will have 32/128/256 GB, the 8 due to its limited availability will have 64/256 GB options. As for this copper/blush gold finish...no like! A leaked, unofficial set of images is assumed to be equal in technical quality to something Apple itself vets/publishes, and taken as gospel? And said images are viewed on a variety (quality-wise) of displays and uncontrolled viewing conditions? The peanut gallery needs to slow their roll, here... passing judgment on these images != passing judgment on the product. looks better than the previouse leaked versions. People will like it, including you, because Apple released it. You will also like all other points of complaint with the early leaked dummies which you thought were fake, and Apple will not release anything like that. You will slowly get used to this color and tolerate it, even if you do not by a turd-brown phone. Anyone taking bets on when Samsung release the S8 Copper model? It's gonna happen now whether this rumour is true or not.